With over 160 years’ experience crafting innovative and quality timepieces, Timex has amassed quite a collection of styles in its archive. 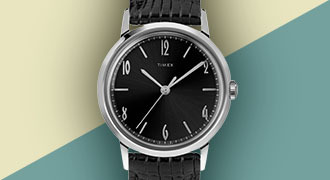 From its humble beginnings in the town of Waterbury, Connecticut, Timex started with a group of artisans and craftsmen who created what would ultimately become synonymous with time itself and propel timekeeping from the … Continue reading "From the Timex Archive"
When it comes to watches, they don’t come much simpler than our Easy Reader®. 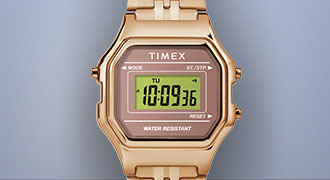 For over 40 years, this basic watch has become synonymous with Timex and continues to be a best-seller. As the wristwatch shifted from being purely functional to a fashion accessory, dial treatments began to rely on aesthetic values rather than readability. 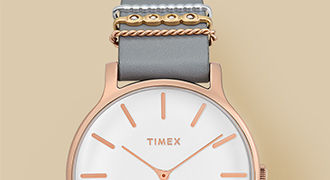 … Continue reading "Why the Easy Reader Endures"
As a faithful update to a beloved 1960s Timex watch, the Marlin® is the kind of timepiece that looks like you inherited it from Grandpa but shines like brand new. Its vintage-inspired appeal is for the old souls who appreciate the beauty of the past, while its modern construction is made for today’s wrist. Here … Continue reading "3 Features to Love About the Timex® Marlin® Watch"
Prior to World War I, a watch nearly always referred to a pocket watch. The wristwatch was invented at the beginning of the twentieth century, but its market had been confined to military use. During the 1899-1902 Boer War in Africa, battle commanders used it to synchronize the movements of army units. 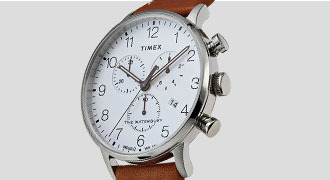 The other wristwatch … Continue reading "From the Pocket to the Wrist"
TIMEX has a long history of producing military-inspired timepieces, but the most iconic style was the Mil-Spec W-46374B. This watch was manufactured for a very short period of time (two months, February and March, 1982) to standards that destined it to be a true throw-away watch. The case back on the original style could not … Continue reading "The Story of the MK1"
While large faces have dominated the market at times, timepieces with smaller cases and thinner straps are experiencing a surge in popularity. Though popularized between the 1930s and 1960s, mid-century modern design remains very relevant today. The style has experienced a resurgence in recent years, with consumers prizing the aesthetic's streamlined forms and functional style in furniture, clothing and accessories.